It is Christ the King Sunday (or Reign of Christ Sunday). The long season of Pentecost/Ordinary Time has come to an end, and before long we will restart the cycle with a season of longing for the coming reign of Christ. We will continue this cycling through seasons until that time when the realm of God comes in its fulness. For now, we experience that interregnum when signs of the realm are present but not fully present. We live in hope, even as we seek to live out the values of the realm. If the churches calendar begins with a season of longing, when, as Amy Plantinga Pauw suggests, “church longs for what lies beyond earthly life and beyond history, for the day when ‘mourning and crying and pain shall be no more’ (Rev. 21:4). But that does not translate into indifference to earthly flourishing here and now” [Pauw, Church in Ordinary Time, p. 121]. On this day, which brings to a close the cycle, we stand before the shepherd, and reflect upon what has transpired in the here and now. How have we lived in the interim? How might the shepherd view our lives? The gospel reading for the day is the parable of the sheep and goats, who are judged by the king based on how they treat the least of the king’s family members (Mt. 25:31-46). That parable draws imagery from this prophetic word in the book Ezekiel, in which the prophet offers a word of hope to a people living in exile. The land is occupied by a foreign power. The beloved Temple is destroyed. The monarchy has ceased to exist, and the leading citizens of the nation have been transported to a foreign land. The people feel lost and alone, and the prophet offers hope that God, the shepherd of Israel, will seek out the lost and restore them to their proper home. In my reflections this Pentecost season, I have followed the semi-continuous readings, which stretched from the call of Abraham to the call of Deborah. 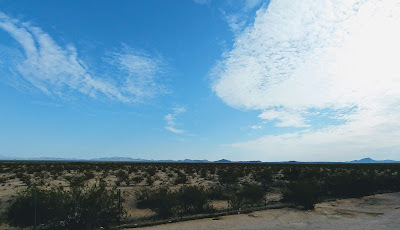 In these readings, which took us from Genesis to Exodus and Deuteronomy and then on to Joshua and Judges, we have been reminded of God’s covenant promise to be a blessing to the nations through the presence and ministry of God’s covenant people. You could make an argument that the “least of these” referenced by Jesus is Israel. How the nations treat the covenant people is the basis of judgment. Blessings come to those nations who bless the covenant people. I will leave that possibility to your own reflections, and return to Ezekiel and the focus of his attention—a people living in exile, sheep who have been pushed aside by seemingly stronger sheep. One key component of this narrative arc is God’s ongoing presence, even when God seems absent. For Christians living in the interim between first and second advent, hope can dissipate. We may feel compelled not only to make peace with the culture, but to allow it to form us in ways that lead us away from God’s promise. The story of Israel is that it is not a rich and powerful nation. It is not like Egypt, Babylon, or Persia. Yet, it perseveres, because God is faithful, even when Israel strays. Thus, the promise of the prophet. Israel is scattered, but the shepherd will seek out and restore the flock. Exile is not its permanent state. In this prophetic word, there is a word of judgment between righteous and unrighteous. Symbolically, this is a judgment not between sheep and goats (as in the parable) but between sheep and goats. Those that eat well at the expense of the others will face judgment, while those who have be pushed aside will in the end be blessed. Here we have an expression of God’s preferential option for the poor and marginalized. Babylon, of course, is rich and powerful. They have pushed aside the smaller and more vulnerable nations, like Judah. If might makes right, then Babylon is the poster child. At least that is true for the moment. That’s because, as God shares through Ezekiel: “I will seek the lost, and I will bring back the strayed, and I will bind up the injured, and I will strengthen the weak, but the fat and the strong I will destroy. I will feed them with justice” (Ezk. 34:16). God will find the strays, bind up the injured, and strengthen the weak. On the other hand, those that are fat and strong, they will be destroyed. Babylon might be big and powerful, but it is no match for the God of Israel, the shepherd, who reigns as sovereign judge. This promise might be attractive, but we live in a society that has bought into the Social Darwinism, a philosophy that borrows imagery from biology, but is not the same thing. Social Darwinism took the idea of “the survival of the fittest” and ran with it. It is a philosophy celebrated today in the visage of reality tv, and found its most visible expression in the eugenics movement of the early 20th century and in the genocidal policies of Adolph Hitler sought to create the master race, which meant that anyone not fitting his vision had to be removed one way or another. Thus, Jews, Gypsies, those with disabilities, gays and lesbians, all had to be exterminated. On the day of judgment, the shepherd will rule against the “fat sheep” that pushed with flank and shoulder, and butted at all the weak animals with your horns until you scattered them far and wide.” These sheep will be culled from the flock, so that the others might thrive. We see this vision expressed in the principle of God’s preferential option for the poor, otherwise known as the “least of these of my family.” The promise of Ezekiel is that a day will come when David’s throne will be restored, and all will be fed and nourished. As Christians, we see this promise fulfilled in the promise of the advent of Christ, who will come in glory as judge and sovereign. In the words of Brian Wren: “When all is ended, time and troubles past, shall all be mended, sin and death outcast? In hope we sing, and hope to sing at last: Alleluia! Alleluia!” [“When All Is Ended,” Chalice Hymnal, 703]. Picture Attribution: Verboeckhoven, Eugène-Joseph, 1798-1881. Shepherdess with Her Flock, from Art in the Christian Tradition, a project of the Vanderbilt Divinity Library, Nashville, TN. http://diglib.library.vanderbilt.edu/act-imagelink.pl?RC=55543 [retrieved November 20, 2017]. 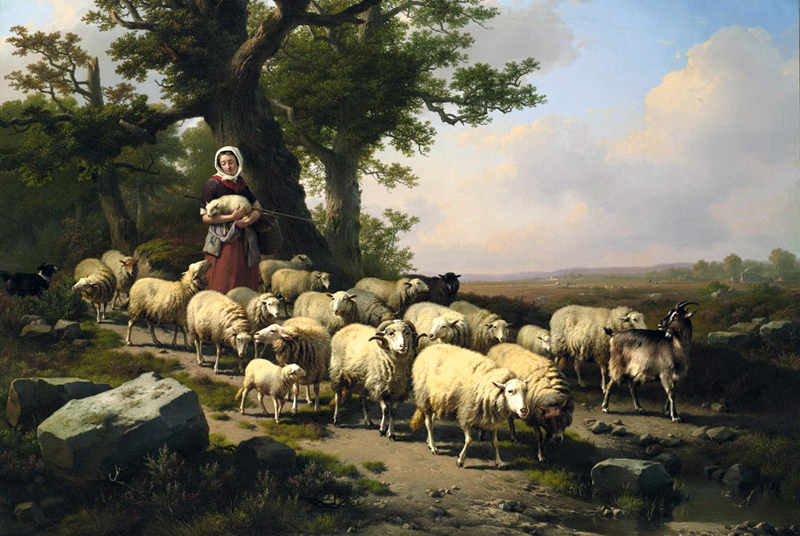 Original source: http://commons.wikimedia.org/wiki/File:Eugene_Verboeckhoven,_A_Shepherdess_with_her_Flock.jpg.